First make the marinade. 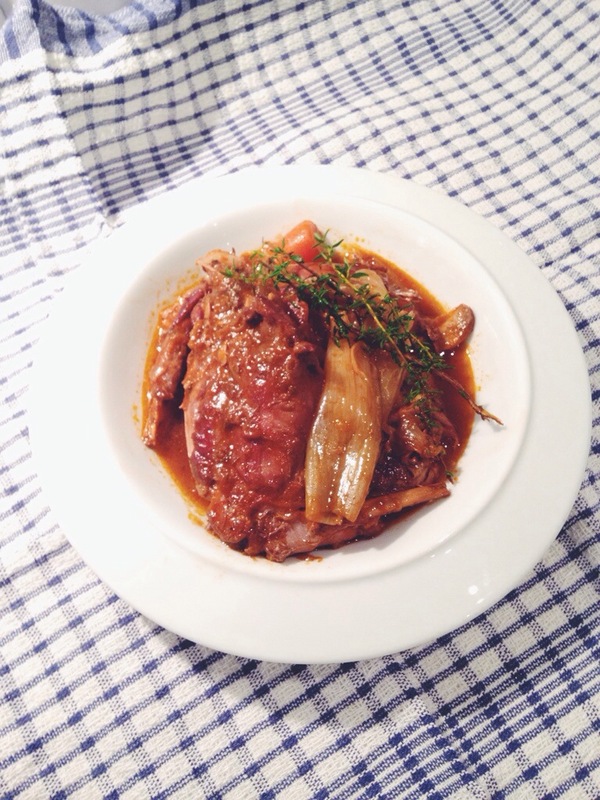 In a large ceramic or glass dish put the chunky onions, carrots, red wine and whole peppercorns. 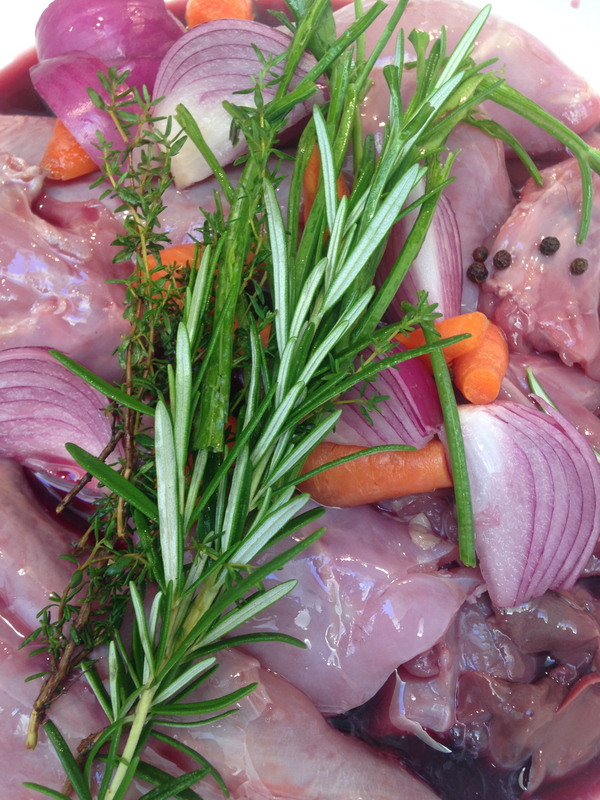 Take the fresh rosemary, thyme and parsley stalks, bruise them slightly with a rolling pin or other heavy implement – add them to the marinade along with the pieces of meat, rabbit or chicken. Mix well, cover and leave to marinade for at least a couple of hours in the fridge, stirring occasionally . If you can, it’s good to leave it overnight. When you are ready to cook the casserole, take the meat pieces from the marinade and pat dry with some kitchen paper. 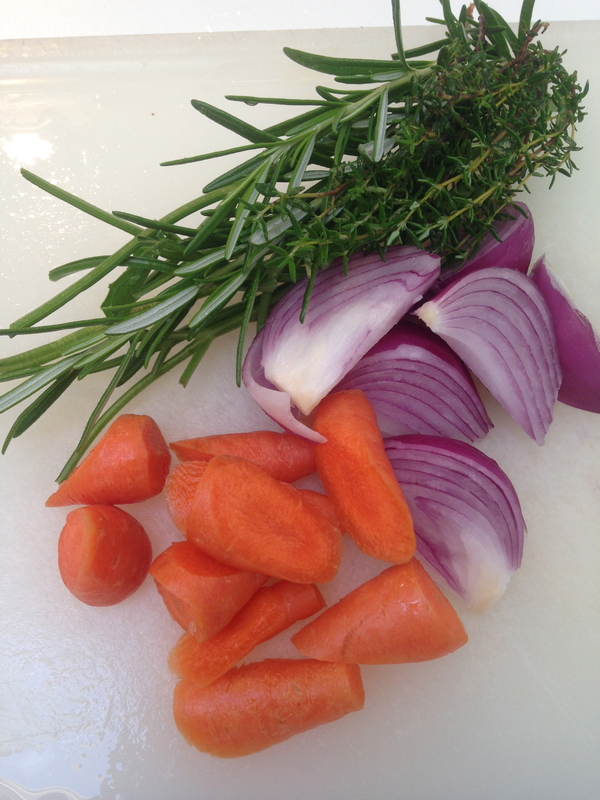 Keep the chunky vegetables but discard the rest of the marinade and herbs. Heat 3 tabs of olive oil in a frying pan and brown the meat pieces, taking care not to over-crowd them. Set to one side. In an ovenproof casserole, heat 1 tablespoonful of oil and brown the chunky onions and carrots and then the crushed garlic. Stir in the tomato pureé and heat through, stirring all the time. Add the red wine and then the water, the cinnamon stick and the bay leaves, salt and pepper. Now add the pieces of meat, bring everything to a simmer. It is possible to cook the stifádo on the hob but I prefer to cook it in the oven. So either leave to simmer for 30 minutes or put in the oven at 180 degrees for 30 to 40 minutes. While that is cooking, prepare the shallots. The easiest way to do this is to leave them with the skins on and blanch them for a couple of minutes in boiling water. Drain them, run them under some cold water, so that they are cool enough to handle. You will find that if you trim off the stalk end, the skins just slip off – and you don’t end up with streaming eyes! Now, heat the remaining olive oil in the frying pan that you browned the meat and gently brown the shallots, taking care that they don’t burn or over cook. Add them to the casserole and cook for a further 15- 20 minutes. Serve with chips, rice or mashed potato.